Our reviewers present their Top Ten discs from the past year, with new releases from Bettye Lavette, Little Milton, Harry Manx, and Shemekia Copeland showing up on more than a few lists. All of the lists can be found in our Pick Hit section. 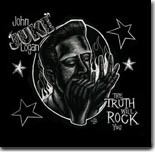 John "Juke" Logan doesn't claim to be a pure blues cat, but his music is always high quality stuff. His latest, The Truth Will Rock You, is no exception. It's this month's Surprise pick. This month's Flashback takes a look back at an unknown gem from Chicago bass player Biscuit Miller. This month's What's New section features new releases from B.B. King, Susan Tedeschi, RJ Mischo, Tutu Jones, Brian Blain, Eugene "Hideaway" Bridges, Mississippi Heat, Tail Dragger, The Campbell Brothers, Tracy Conover, and more.